The nation of Syria commands more headlines today than it has at any other time in modern history. Since 2011, the country's very name has conjured up images of revolution, civil war and an increasingly dire refugee crisis. For American politicians, Syria has become another buzzword they use to polarize supporters and detractors. Many state governors are currently contesting the Obama administration's policy of accepting refugees fleeing that country. Gov. Peter Shumlin's recent decision to welcome Syrian refugees has sparked both protests and plaudits. But for Waltham resident Deborah Harte Felmeth, who has lived in Syria intermittently for the past 20 years, the country has less contentious associations. It's a land of welcoming people, beautiful traditions and arresting countryside. Her view of the place — both literal and figurative — is the subject of her book of photographs Syria: Remember Me, recently published by Bard Owl Books, an imprint of Wind Ridge Books of Vermont. Felmeth first visited Syria in 1991, when she was 37, to take a job teaching music at the Damascus Community School in the nation's ancient capital. Her growing fascination with Syria led to further travel within its borders. Over the years, she came to know it so well that she and her Syrian native husband led tours of the country. Syria's civil war, which began in 2011 and continues to rage today, eventually forced the couple to bring their tour operations to a halt. Felmeth's voice was tinged with regret when she talked with Seven Days about the impossibility of returning to Syria now; she regards the country as a second home. Over coffee, Felmeth quickly noted that she's not a professional photographer — in Vermont, her bio states, she works as a piano, voice and yoga teacher. "If I had known, back in 1991, that I was taking photographs for a book, I would have changed my camera!" she said with a laugh. Still, Felmeth has captured striking images unlike those we see in the news these days. 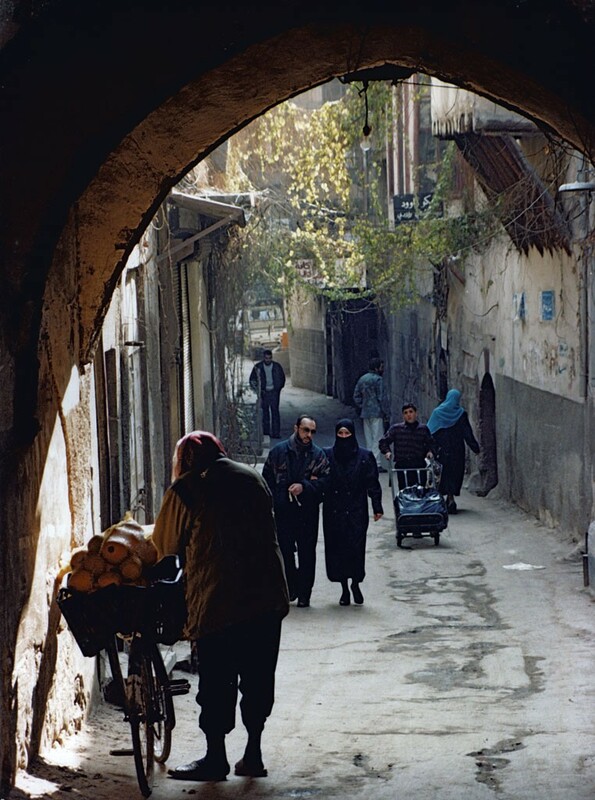 The photos in Syria: Remember Me, taken between 1991 and 2011, show landscapes, market vendors, worshippers, whirling dervishes — a country's everyday life. "I took the photographs because I was in extraordinary situations and felt that I was almost continuously being given treasure," Felmeth said. 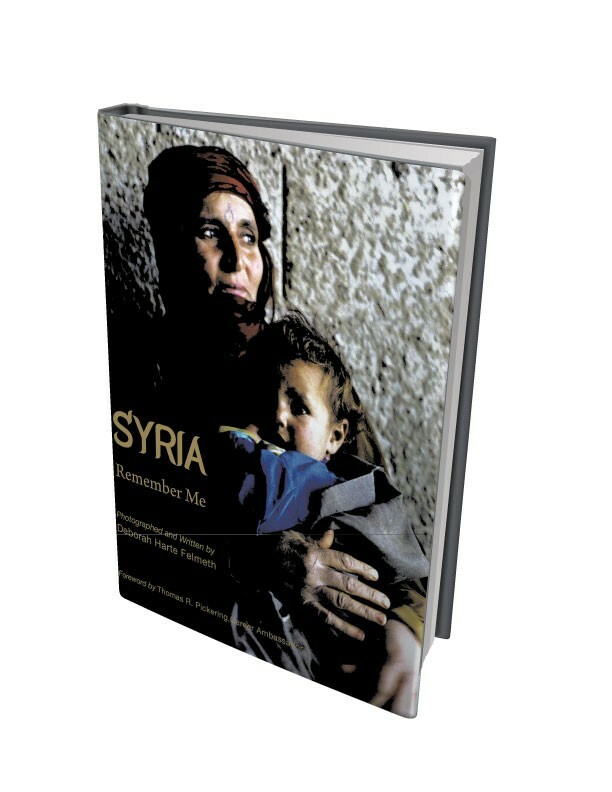 She selected several images from Syria: Remember Me and shared the stories behind them. 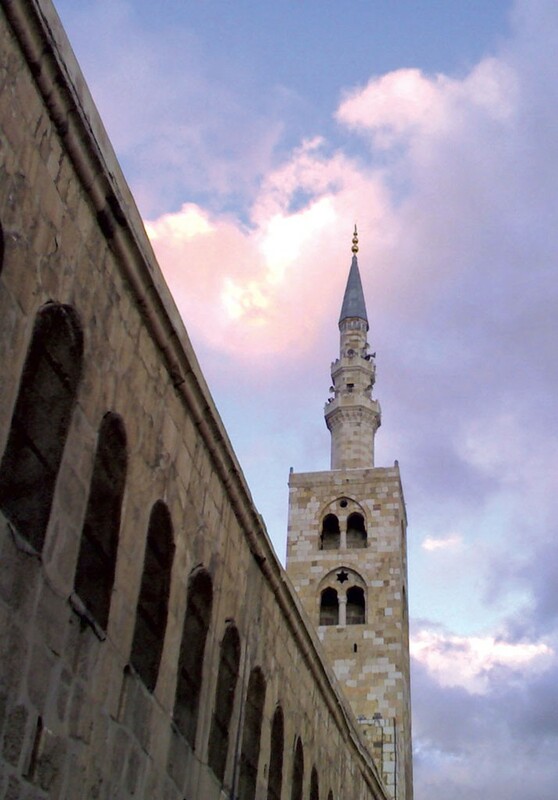 "This is the second-oldest stone mosque in the world. Inside it is a mausoleum holding the head of John the Baptist. Before it was a mosque, it was a cathedral; underneath the cathedral is a Roman temple of Jupiter; underneath the Roman temple is a pagan temple for the god Hadad, the god of thunder. "Alongside the mausoleum, the first time I was in Damascus, I remember seeing a line of men hunched over, sitting on the ground. They didn't look well. I wondered, What is this about? Then I realized they were all blind. [A friend explained that] when they were young, they were sent for religious education, and they memorized the Quran. A child who has no sight has limited opportunities for work, and [many Muslims believe that the blind] have more insight because they don't see the outer world — literal insight. Therefore, these men would wait for anybody who needed to talk. People would walk up and go, I'm gonna talk to that guy, and they would sit. Then the men would straighten up, they would listen, they would counsel. Then the people would put a little money down." "The man on the left is peddling his wares through the Old City: oranges from the Mediterranean coast. One of the wonderful things about living in the Old City of Damascus is hearing the cries of the street sellers. I would be sitting downstairs, and I would hear [clinks spoon repeatedly on mug], and I would know that the gas-bottle seller was there. You might hear someone going through the street saying, 'Tender, tender, tender as babies' fingers' — selling little tiny cucumbers. Each seller has his own melody." "This is the very edge of a pre-pottery archaeological site — I think that's the third millennium [BC], but I'm not positive. [The houses at left are] the 'modern village': mud brick. They make and bake the mud bricks, which are coated with wattle and daub. Very, very beautiful houses with poplar roof beams. At this site, a team of archaeologists from the University of Chicago discovered the first evidence of the change from round to square in dwellings, so this turned out to be an extremely important site. 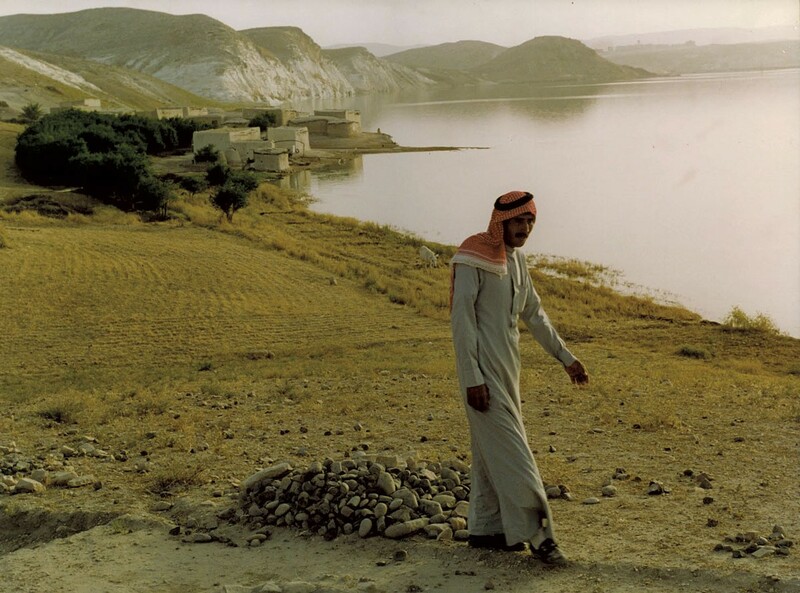 "This was [taken] in 1994, and the Syrian government was, during this period, designing and building the second hydroelectric dam on the Euphrates in this region. So it was known that this was going to be flooded. The archaeologists were working in great haste. It was known that the water was going to rise and was going to cover that village. "Speaking to this man, I said, 'What are you going to do?' And he said, 'Wait.' 'What do you mean, "wait"?' I said. 'When the river moves, we'll move. The government has given us concrete blocks and rebar, but we don't really want the concrete blocks and rebar, because they don't build a house as good as this. So we are making mud bricks. But we're not going to move until the river moves.'" 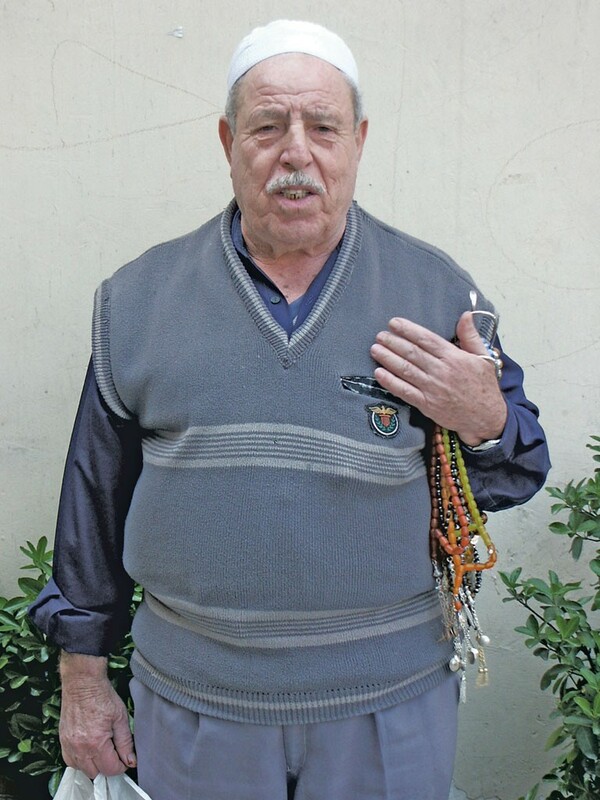 "This man, with all these prayer beads under his arm, had such a beautiful voice. I would hear him from two or three blocks away, and I would try to find him. [Sings in Arabic.] That means 'To whom can we complain? You are forever, you are forever.' And, of course, he was selling prayer beads. My husband would always laugh at me: 'You bought more prayer beads from that guy?' I would say, 'No, I love his voice!'" The original print version of this article was headlined "Damascus Dreams"